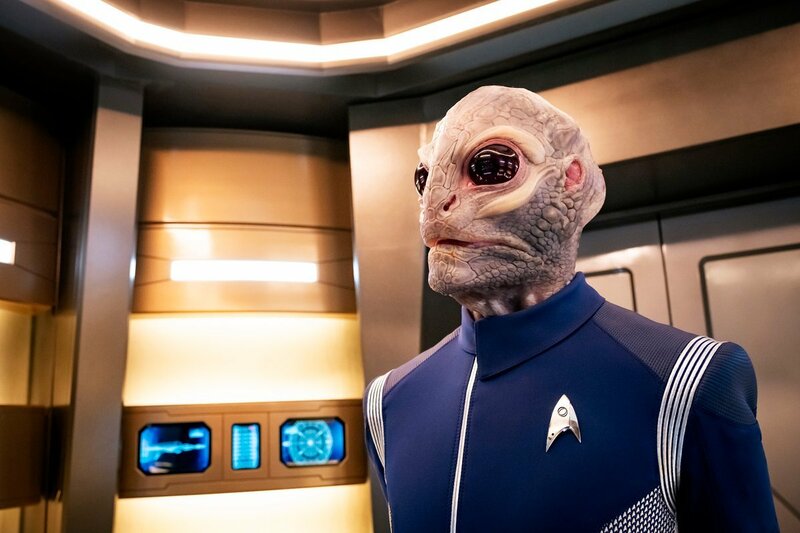 We’re still a little over a year away from the debut of the highly-anticipated second season of the CBS All Access hit Star Trek: Discovery, but CBS has released new photos from the return of the crew and can be viewed in the gallery below! The cast includes Sonequa Martin-Green as First Officer Michael Burnham, Michelle Yeoh as Captain Philippa Georgiou, Jason Isaacs as Captain Lorca, Doug Jones as science officer Saru, Anthony Rapp as fellow science officer Stamets, Terry Serpico as Starfleet admiral Anderson, Maulik Pancholy as chief medical officer Nambue, Sam Vartholomeos as junior Starfleet officer Connor, Mary Wiseman as Cadet Tilly, James Frain as Sarek, astrophysicist and father of Spock, Chris Obi as Klingon leader T’Kuvma, Mary Chieffo as L’Rell, a Klingon commander, Shazad Latif as Lieutenant Tyler, Rekha Sharma as Commander Landry, Kenneth Mitchell as Kol, Clare McConnell as Dennas, Damon Runyan as Ujilli, and Rainn Wilson as Harry Mudd. The series is produced by CBS Television Studios in association with Alex Kurtzman’s Secret Hideout, Bryan Fuller’s Living Dead Guy Productions and Roddenberry Entertainment. Alex Kurtzman, Bryan Fuller, Heather Kadin, Gretchen J. Berg & Aaron Harberts, Akiva Goldsman, Rod Roddenberry and Trevor Roth serve as executive producers. The series will be distributed concurrently by CBS Studios International on Netflix in 188 countries and in Canada on Bell Media’s Space channel and OTT service CraveTV. The second season of Star Trek: Discovery is set to debut sometime in 2019. The post New Star Trek: Discovery Season Two Photos Revealed appeared first on ComingSoon.net.